So you’ve tried everything. You’re using all the right hair products and you’re moisturising religiously. But it’s just not working. Your hair’s still dry and it’s beginning to break off at then ends. If you’ve done everything by the book and your hair’s as dry as ever, there could be other forces at work. Hard water can really take its toll on black hair that’s already prone to dryness and frizz. Some areas in the UK suffer from hard water due to minerals that collect in the water as it flows from its original source. These minerals – such as calcium, lead, iron, magnesium and copper – can have a devastating effect on natural curls. So, how come some areas have hard water and others don’t? Well, it’s due to the amount of contact the water has with the earth. As it makes its way to your taps, water gathers chalk and minerals from the soil and rocks. The evidence of this is that yucky stuff that collects in your kettle. Yeh – the very same stuff that can eventually kill your washing machine. What is it doing to my Hair? Now imagine all that nasty stuff attaching itself to your hair, if you will…not good, right? When it fastens itself to your scalp and the outer cuticle of your hair, it can cause dandruff, block your hair follicles and prevent all that lovely moisture from getting to your curls. And it certainly won’t do you any favours if you suffer from eczema. You may notice that your shampoo doesn’t lather up much, and that’s down to hard water too. As well as leaving afro hair dry and feeling straw-like, hard water can upset the chemical balance of your hair. pH is measured on a scale of 1 to 14, from acid to alkaline. Hard water has a pH of 8-8.5, meaning that it is slightly more alkaline than soft water. Your water should be a 7, the perfect balance of acid and alkaline. The elevated pH level in hard water can cause your hair shaft to swell up and make the layers of cuticle lift. When your cuticle layers are lifted, the cortex of your hair is more vulnerable so your beautiful afro hair can become damaged and break more easily. Now we know what hard water does to natural hair, let’s get down to some solutions. There are a few ways you can overcome this problem. You could try tackling it at source: install a water softener to your plumbing system. This will provide a long-term solution and give you lots of soft water that your hair will love. Water softeners can be very pricey but I guess it’s cheap than moving to a soft water area! A cheaper alternative is a water filter. You simply attach this to your shower head and it can help to make your water soft. Invest in a decent water filter that will filter out ALL the bad stuff, or at least most of it. Finally, you can try treating natural hair that has been exposed to hard water. Normal shampoos won’t work. For this you’ll need what’s called a chelating shampoo. Put simply, chelating shampoos contain ingredients that bind to the minerals and lift them from your hair. Look for a shampoo such as Aveda Shampure, which will do the job nicely. It’s also reasonably priced. If you can’t get your hands on a bottle, look for shampoos that contain an ingredient called EDTA, which is short for ethylenediaminetetraacetic acid. Yeh, a bit of a mouthful! This ingredient will remove all those metals from natural hair effectively. You could also try using a clarifying agent like Apple Cider Vinegar – but this probably won’t be enough to remove the build up of minerals on your hair. Try some hard water solutions to see how your hair responds. Let me know how you get on! P.S. Another point: it’s best to use harsh shampoos only once a month or when needed. Chelating shampoos and clarifying shampoos are very drying to hair that’s already dry…so try using a moisturising shampoo in between. I came across this helpful Youtube video on this subject so I thought I’d add it here. Find out if you live hard water area. 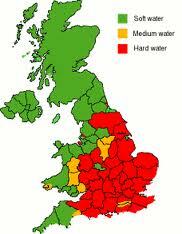 Check out the map of UK hard water areas below. Do you have questions about growing healthy afro hair? Share advice and tips at the Natural Hair Forum UK. If you have any information about black hair and hard water, let us know! Your comments would be welcome.